From October 14-18, Solace experts were among the thousands of CIOs and senior IT executives that came together in Orlando at the 2018 Gartner Symposium/ITxpo. Industry leaders gathered to discuss key topics, network and to identify new technologies that can help power their digital transformation projects. Event-driven computing and event-driven architectures were hot topics at the event; Gartner had previously identified them as “a top 10 strategic technology” for 2018. Early in the week, Solace CTO Shawn McAllister took the stage for a presentation titled, Event Mesh: The Architecture Layer That Will Make Your Business Event-Driven (watch presentation below). McAllister positioned event mesh as complementary to service mesh, but more suitable for modern applications that need to communicate in an asynchronous, publish-subscribe manner (as opposed to synchronous, point-to-point communication over REST/HTTP). He also described how an event mesh could be deployed across public, private and non-cloud environments to provide a single, unified communications layer for efficient event distribution across distributed enterprises. A real-world example of an event mesh in action was provided by Joshua Carroll, Global Head of Market Data & Messaging Technology at RBC Capital Markets. Carroll joined McAllister on stage mid-way through the presentation and provided a glimpse into RBC Capital Market’s digital transformation journey with Solace, sharing his team’s experience rolling out an event mesh before the concept had a name. 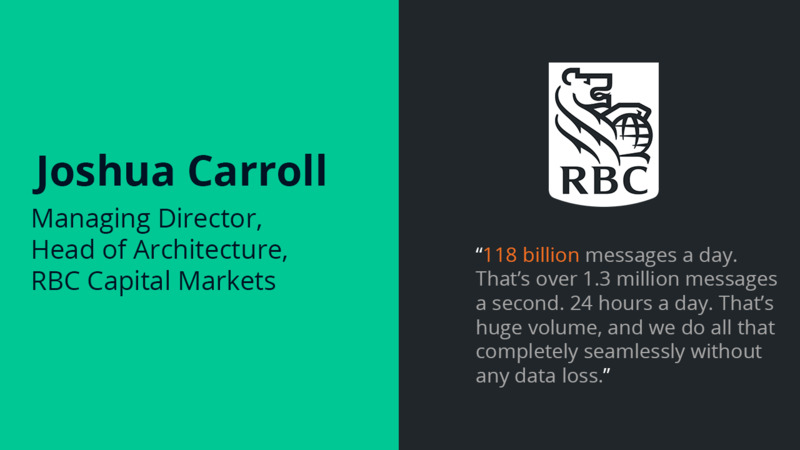 Through their eight-year journey with us, RBC Capital Markets has been using our messaging technology to process immense amounts of data, said Carroll. Although the slides behind him said the number of messages processed by Solace for RBC was 60 billion/day, Carroll said the rate far surpassed that just a few days before he presented. Carroll said a lot of people aren’t aware of how big RBC really is, but they have 50 Solace appliances deployed across different countries. Sydney, Hong Kong, Tokyo, London, New York, and Toronto are a few of the major sites and places where RBC has Solace support. From 2pm EST every Sunday afternoon until 10pm every Friday night, the bank constantly has messages that are flown between six geographies in real-time throughout the day. “For those five and a half days, 24 hours a day, we can’t afford to have any issues or problems on our data flow,” said Carroll. The bank came across Solace in 2010 when it was looking for alternatives to their previous messaging solutions. A company as large as RBC Capital Markets can’t afford to make any mistakes, and the lack of downtime Solace offers held significant appeal, said Carroll. “It’s as simple as just permissioning the access control for an application to come online so I can roll out a new application in the middle of the week, and I don’t have to restart anything,” he said. Carroll said that he’s appreciated the restriction of unnecessary data flow over the bank’s eight years with Solace. The technology rules out the need for things like River Bed Technologies that compress data and WAN optimizers, because Solace appliances do that out-of-the-box. After eight years of working together, what’s next for RBC and Solace? Carroll said that the bank is still very much an on-premises architecture, and that won’t be changing anytime soon. However, they are taking steps to move forward. Carroll uses the example of RBC’s FX Trading Platform, where it is complex to share data with clients. If cloud is enabled and Solace is used as the messaging backbone, Carroll said it would eliminate the need to build against any specific one of the public cloud messaging proprietary formats, and that the bank is in the process of building this out over the next year. Carroll’s glimpse into RBC’s real-life deployment of an event mesh—and what a network of interconnected advanced event brokers looks like when deployed inside of a large company—has the potential to light the way for the many other enterprises whose digital transformation will in some way rely on an event mesh.